What do you get when you cross a mini milk carton idea from the Stampin’ Up! 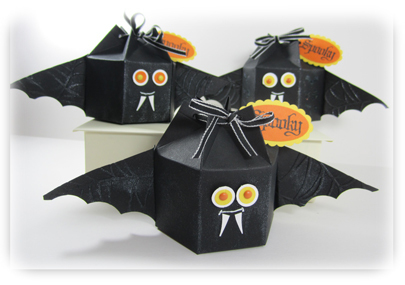 Convention with a bat idea from Shelli Gardner at a Stampin’ Up! Regional? We made these at my Stamper’s Club September meeting and my PAWS Downline meeting this weekend. Now do you want to know how to make one? Well you are in luck because I’m going to tell you. I’m writing a tutorial and will attach here as a pdf file for you to download. CLICK HERE to download the tutorial on how to make these. It also includes the instruction for how to make the hexagon shaped milk carton box with pictures of how to assemble the bottom in case you just want that part on not the bat in particular. Enjoy! This entry was posted in Big Shot, Halloween, Stamper's Club, Tutorial and tagged Big Shot, Monika Davis, Stampin' Up!. Bookmark the permalink. Thank you–so cute & fun for Halloween! Fabulous Monika!!!!!! Thanks so much for the tutorial!!!! !